Happy Monday everyone! I hope you had a good weekend. Apart from one social gathering, we had a fairly relaxing weekend. I was thankful the weather was gorgeous as it has been dull, grey, and rainy most of the week. It finally cleared up on Friday leaving the weekend with lots of sunshine and clear blue skies. The days are getting shorter and many of the maples trees in the neighborhood are showing signs that fall is upon us. It seems to me like the orange hues are normally the first ones to appear, followed by red, and finally yellow. 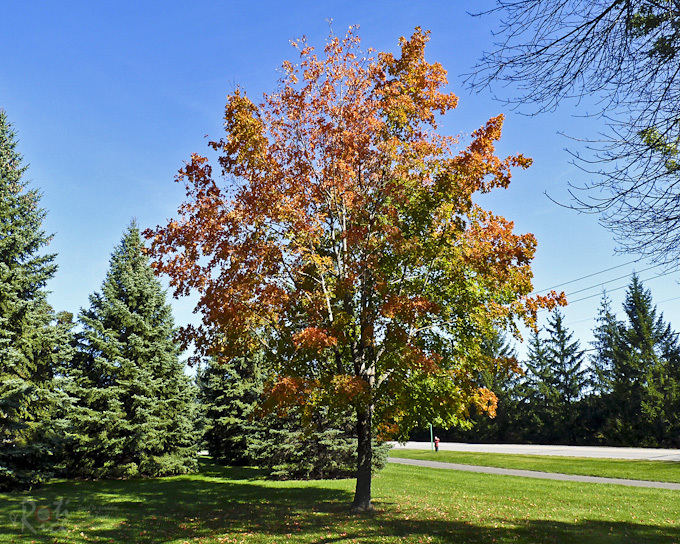 We have a few mature trees in the yard and they all turn yellow. I wish the people who first lived here would have planted some trees with leaves that would turn orange or red. Enough of the weather but before we move on today’s recipe, I would like to let you in on some changes that will be coming up soon. Roti n Rice will be moving to WordPress in the next few days. She will have a new look and her own domain. Hopefully the move will go smoothly and my next post will be on the new platform. And now let’s get back to the Dhal Curry…..
Dhal curry is a very mild and nutritious curry made up mainly of lentils, tomatoes, and chilies. Sometimes potatoes and gourds are added. Very few spices are used and the heat level can be adjusted by using more or less dried chilies. This curry is very kid friendly as it can be made relatively mild. 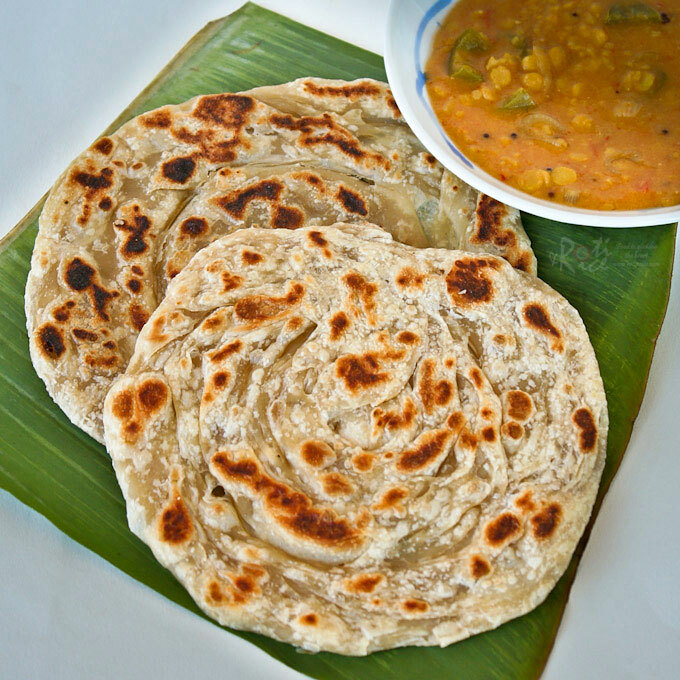 In Malaysia and Singapore, Dhal Curry is often associated with the ever popular Roti Canai (roti pratha) and is usually eaten during breakfast. If you wish to make your own, please check out my recipe by clicking on the picture below. Otherwise you can purchase frozen ones from the Asian and Indian grocery stores. It only takes 2 to 3 minutes to fry up one of these delicious flat breads. There are many versions of Dhal Curry out there. This one is the one I am most familiar with. 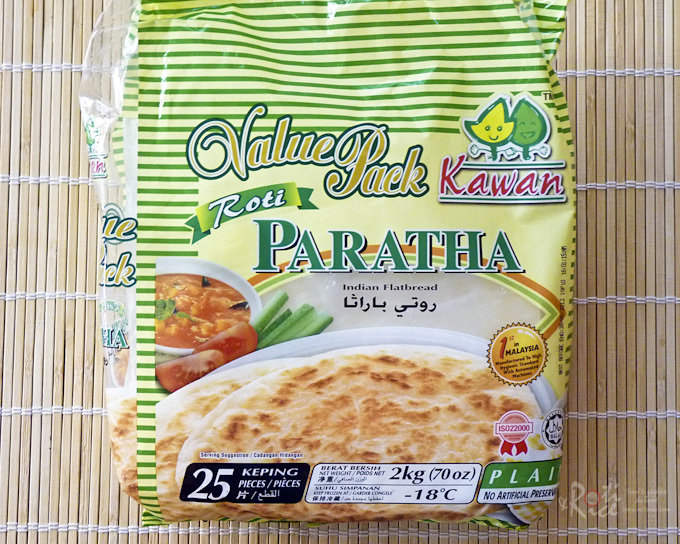 It has all the ingredients found in the version served in most Malaysian Indian restaurants. I have made it thicker but you can certainly thin it out by adding more water if preferred. Sometimes, I like to add eggplants (brinjals) into the curry. To see what that looks like, please check out my Dhal and Eggplant Curry. There is a video in this post and you can see exactly how this dish is made (same steps) in the video. The other vegetable that I have seen and may be used in Dhal Curry is moringa oleifera, commonly known as “drumsticks”. Here is the US, I can buy frozen “drumsticks” at an Indian grocery store not far from where I live. I even managed to buy fresh “drumsticks” once at the same store and to make this Drumstick Shrimp Curry. Please do check out the post if you are curious to see what fresh and frozen “drumsticks” look like. There is a picture of the packaging of the frozen ones in that post. Place dhal in a medium sized pot with ginger, garlic, dried chilies, curry leaves, ground turmeric, and 2 cups (480ml) water. Bring to a boil. Season with salt, reduce heat and let it simmer for about 20 minutes until dhal is soft. Remove from heat. Using an immersion blender, pulse several times to desired consistency. In a fry pan, heat butter. Add mustard seeds. When it crackles, add cumin seeds and onion. Fry until onion is slightly brown, about 3 minutes. Add jalapeno peppers and tomatoes. Cook for 2 to 3 minutes. Transfer fried ingredients to the pot with cooked dhal. Place pot back onto stove and cook for 5 minutes. Turn off heat. 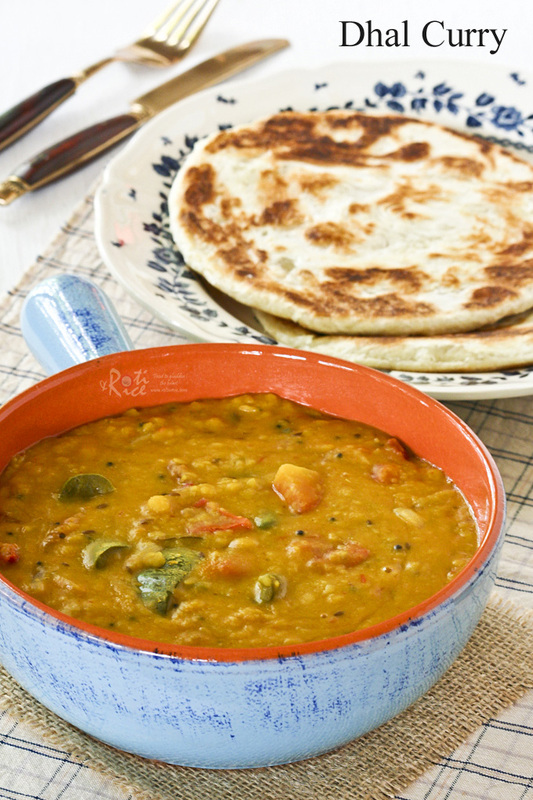 Dhal Curry is delicious served with Roti Canai (roti pratha), as mentioned previously. It is equally delicious served with plain white rice. Dhal Curry is a great side dish for a vegetarian meal. 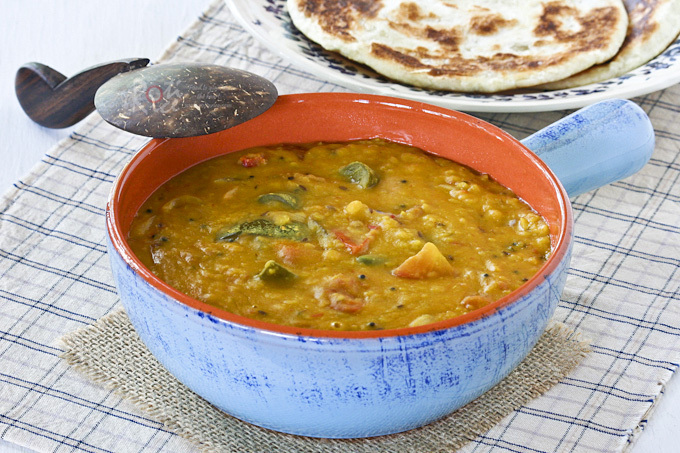 Here are two more dhal (lentil) recipes that may interest you. Simply click on the image to get to the recipe. NOTE: This post was updated on September 2nd, 2013 with new pictures and writeup. No changes were made to the recipe. Dal looks delicious and comforting, Biren! delicious looking dal. love lentils with veggies. This looks like a delicious dish, Biren! Weather is dull and gray here also with rain expected for the week. The tree is beautiful and good luck with your move to WP! All of those vegetables cooking in your pan made me want a bowl of this right away! It looks too good! Thank you for sharing such a delightful recipe with us. I'm glad that the weather cleared up for you a bit…that is always such a blessing! I love the colour of your Dhal curry Biren. Any curry that is kid friendly surely has my attention as these days I find myself cooking only dishes that my kiddies can enjoy too. This sounds delicious and very comforting. Parathas are my favorite thing to have with curry. How exciting that you're moving to wordpress. I use it and really like it. Hope all goes smoothly! Loved to see a perfect indian flavoured curry here….lovely Dhal dear…. Wonderful delicious flavors here! Good luck with moving to wordpress! What a satisfying curry! Looks perfect served with the roti! The dhal looks really delicious. I love your step by step presentations. Good luck with your transfer to WordPress. Curry….mmmmmm. This looks amazing. Thank you for showing us in detail how it's supposed to be done. I can't wait to try. The curry looks so good! And all the best with your new blog! I LOVE dhal and can it eat for days on end and never get bored. Yours looks absolutely fantastic. Just reading the recipe is making me imagine the smell of the onions and cumin frying. YUM!!! 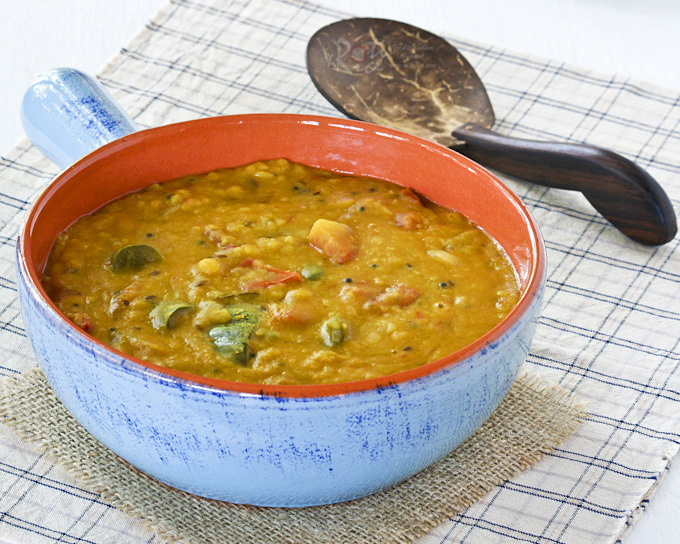 I made Indian Sambar recently – looks almost similar to the Dhal Curry you are making. WOW Biren! You made this too! Looks so delicious and I love it. Good luck with the move! How exciting! This sounds so delicious. Warm, hearty comfort food. Hi Biren. Dhal curry! Something I must re-introduce to my children. I remembered they loved it when they were young toddlers, minus the chillies of course. Thanks for the post, it is timely as I am thinking of introducing some "spicier" foods to the kids. Good luck with the move. Good luck with the move Biren! Let me know if you have any questions or issues; not that I can answer them of course. lol I love the look of your dhal! so yummy! All the best on the move. Let me know how it goes! I am still on the blogger platform and tpp scared to learn wordpress. Let me know the benefits yeah. Wow, Biren. This is so easy and quick. It looks like it is a delicious slow stew. I ate a jalapeño on a sandwich I made today though. They confuse me. Sometimes I cut into one and it is spicy but still not so much that I can't taste the wonderful flavor of the pepper. Other times, my mouth is so on fire that I seriously consider dunking my whole head in the toilet (smile). For the record, I have not done that…yet;-)! Woweeeeeeeeeee!! Oh, I LIKE it!!!! I really do – so bright and fresh, I can almost smell it! This was definitely a good idea 😀 Congrats Biren, on your beautiful new virtual home!! Thanks Denise! I am glad the bulk of the work is done. You will likely see some small changes and additions in the coming days. Congratulations Biren on your new home 🙂 Nice and spacious layout! Love, love, love the new look!!! Enjoy your new site! Thanks Julie! It’s way cool but lots of stuff to learn. Now I’ve gotta figure out how to create a post. Perfect with paratha on a gloomy day, sunny day or any day. Do i have to pop the dhal into a blender? Or can I simply cook it for several hours in a thermal cooker? I don’t have a food processor. You can leave it as is as long as it is soft. It will just be chunkier than if you blend it. Even when blending, you do not want to puree it. Just pulse so that it does not become baby food. This looks so delicious, but I can’t get curry leaves in my tiny Canadian town. Can I just substitute curry powder to taste, or will that completely throw the whole thing off? Thanks!! Curry leaves are totally different from curry powder. You can totally leave it out or use 2 bay leaves instead. just cooked it and somehow its really hot but it is amazing!!!! I am glad you enjoyed this dhal curry. Perhaps you can leave out the dried chili peppers or just use one instead of two to reduce the heat level. I have been searching for recipes for yellow split peas and came across your blog post. My father is a farmer here in Canada and sells mass amounts of yellow split peas to be exported to India, Asia. Ironically, we ourselves don’t eat them and I am trying to find recipes to use them. Green split peas are used most commonly but in one dish, French Ham and Split Pea Soup. I attempted to hull and split these dried peas and make into a dal. Are there other uses for the yellow split pea? I had a hard time even finding a name for them, perhaps matar ki dhal? Yes, there are definitely other uses for split pea. Here in the US, split pea soup is one of them. Here is a link to my version – Split Pea and Sausage Soup. Green split peas are similar to Puy lentils except that Puy lentils hold their shape better. Do check out my Lentil, Kale, and Roasted Tomato Soup. which lentils/dal have u used for this recipe? I used chana dhal but you can also use toor dhal which will cook a little faster. This is one of my favorite recipes ever! There is a simplicity of it, yet guests think you’ve slaved away all day! The warmth of the curry can warm you right up and is comforting as well. Even my small kids love this. Serve it with Naan from the bakery….yum! Thanks for sharing because I keep coming back for this receptive. Wow…thank you! Very happy to hear that you and your family enjoy the curry and recipe. It is also my youngest son’s favorite. 🙂 Happy New Year! I found your recipe today…..promptly made it! Yummmm……….I had to sub pickled jalapeño as a ran out of fresh….and my husband thought it too spicey….prob changed the taste a bit but it was still really good! Next time I’ll turn the heat down? I mix in shredded coconut flesh at the end and stir in the fresh cilantro let it sit for 10 mins the cilantro infuses into the lentils. Fantastic recipe! The best dhal that I have made so far. Also my husband who is actually from India enjoyed it a lot! I can’t get mustard seed. Can I replace it with something else? Or totally remove it from recipe? Thanks! Yes, you can omit it.